When it’s time to plan my favorite meal of the day (dinner) in the middle of busting through work and homework assignments, I think about one ingredient, and then I ask the Google Gods for help. 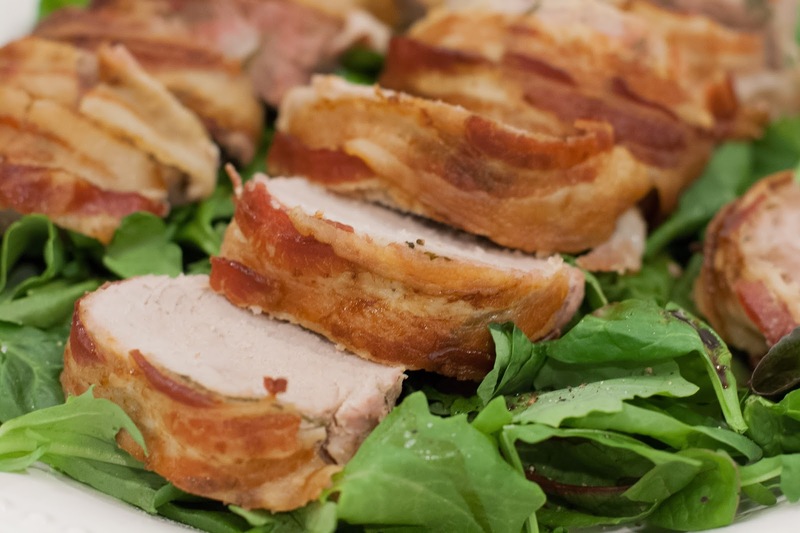 This google search started with “bacon wrapped pork tenderloin” and a million recipe links popped up. Five star recipes for a “pork on pork” bonanza had me bouncing from page to page probing the internet for the most amazing bacon wrapped pork tenderloin recipe ever, only to be left torn and confused, oversaturated, like I myself was bacon wrapped pork tenderloin about to get broiled in the oven. I almost gave up and ordered from my favorite Indian restaurant, ironically named Philly’s Best (welcome to Baltimore), because I couldn’t handle the pressure. Then I remembered I’m not rich and famous enough to eat out every night, not to mention the expanding waistline and my love of cooking being put on the sidelines for far too long. I calmed down, repeated my mantra, and remembered to listen to my gut because it always guides me in the right direction. 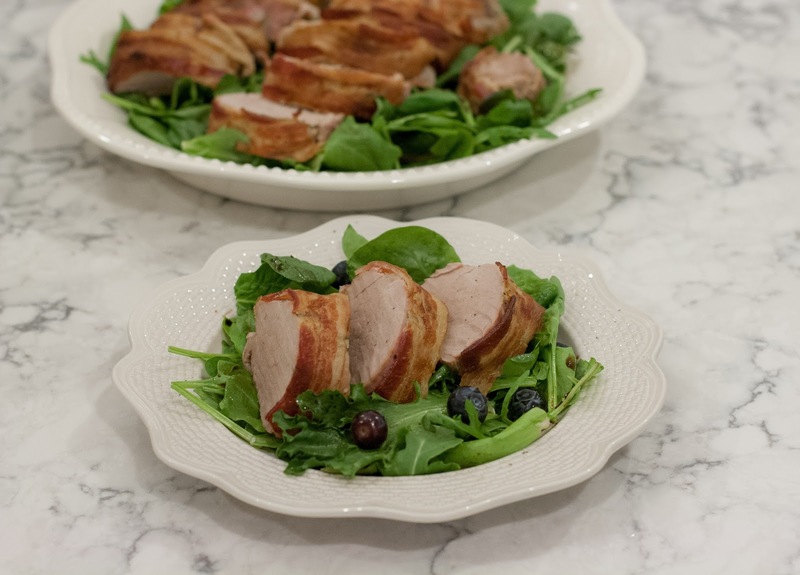 This recipe for bacon wrapped pork tenderloin has four ingredients (not counting salt and pepper) and is a cinch to make for us busy people. It can feed a family of four with enough piggy goodness to cover a couple meals. I foreshadow it becoming a staple in your week night dinner routine. It took me a few tries to get it right. The first time, I didn’t cut the bacon in half and wrapped it around twice leading to bacon shrinkage and a less appealing finished product. The next time, I tried cooking it at an even 375° until the bacon was crispy brown which dried it out. Then, I remembered my all-time favorite way to make pork tenderloin: a 500° oven baked for 5 ½ minutes per pound, then, without opening the oven, turn OFF the heat and let it sit in the unopened oven for 45 minutes until it is cooked to a perfect 155°F. While I didn’t follow the above temperature variation exactly, the technique of high heat then low heat followed by a quick broil cooks the bacon perfectly while the middle stays tender. Please read this recipe FIRST before starting. You have to change the oven temperature three times and use a timer to get it right, but it comes out perfectly every time. It’s crispy on the outside with a moist center creating the succulent savory dish you dreamed of during your mid-day google search. Arrange a rack at the top of the oven, and Preheat to 500°F. Coat each tenderloin with Dijon mustard, salt, pepper, and fresh rosemary leaves. 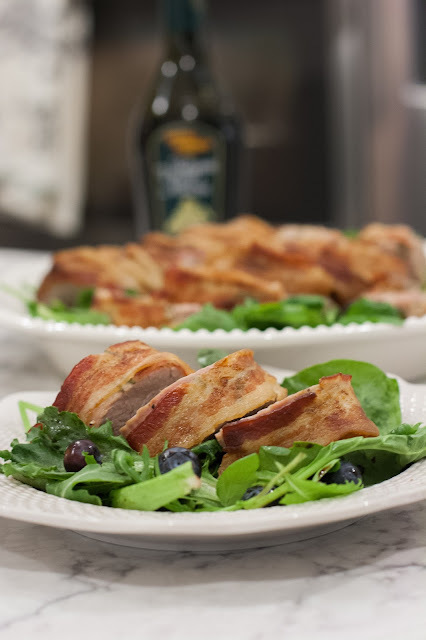 With thinly sliced bacon that has been cut in half, wrap the bacon around the tenderloin starting at the top and tucking under the bottom overlapping as you go. Repeat until the tenderloin is completely covered. Place on a baking sheet side by side and roast until the bacon starts to render; about 11 minutes (remember, 5 1/2 minutes per pound). Without opening the doors (I'm serious. Don't touch those doors! ), turn off the oven. Leave the tenderloins in the hot oven for 45 minutes. Turn on the broiler and watch carefully. Broil until the bacon is golden brown and sizzling; about 5 minutes. The timing above is fairly accurate to get the temperature of the pork to 155°, but all ovens are different. If you aren’t sure the tenderloins are cooked thoroughly, the internal temperature can be tested with a digital meat thermometer placed directly in the middle of the thickest part of the meat. Be sure not to poke through to the bottom of the pan to get an accurate reading. Bacon makes everything amazing. :) This looks delicious - and simple. Interesting about the 3 temperature changes. I wouldn't have thought to do that but makes perfect sense!